Hope's press-fit bottom brackets feature high quality sealed cartridge bearings, providing a solution to the press-fit bottom bracket minefield. 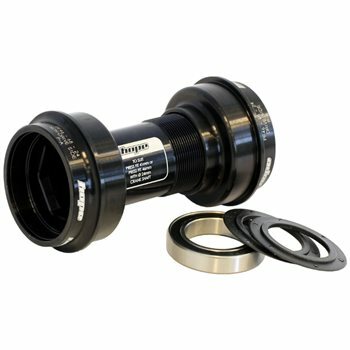 For frames requiring a 46mm PressFit bottom bracket. PF bottom brackets are designed to fit bikes with a threadless bottom bracket cup. The bearing cups thread into a centre tube to give a very secure, safe fit (24mm axle version only). Stainless steel cartridge bearings which are replacable. Ability to convert the bottom bracket to fit Truvativ GXP cranks with a simple shim adaptor. Specific fitting tool required - purchased separately.